Vitamin D is so essential for our existence that our bodies have evolved to get it from the sun, the only nutrient source that’s available on almost every square inch of the planet. Ironically enough, that’s why so many of us are deficient. That brilliant tactic wound up backfiring when our species stopped going outside. (Our aversion to regularly sunbathing naked doesn’t help, either.) Not only does modern, sedentary life tend to reduce our sunlight exposure, it also causes us to store more body fat – and that makes us even less likely to meet our Vitamin D intake. Much of the nutrient is stored in our adipose tissue, so more body fat means less is available for use. That’s bad, because it’s stuff is super important. Vitamin D controls the expression of over a thousand genes, which is some four percent of the entire human genome. So, what does that mean? For athletes, there are more potential benefits. Vitamin D has been linked to reduced inflammation and pain, a lower risk of fractures, and an increase in muscle protein and type II muscle fibers. Studies have also drawn connections to improved VO2 max and force and power production. Vitamin D also has a pretty strong link with testosterone. 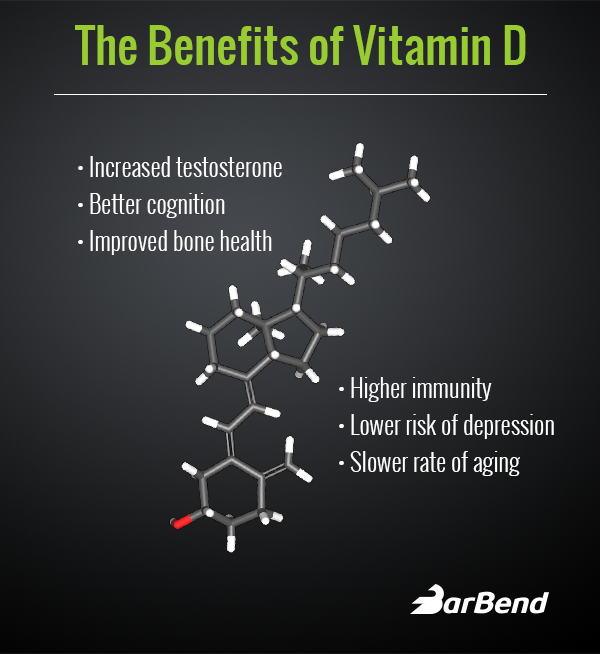 Some studies have shown a correlation between sunlight exposure and testosterone levels, and one showed that 3,332 IU (international units) of Vitamin D every day showed a significant increase in testosterone (about twenty percent) after a one-year period. It’s worth pointing out that these increases are typically seen among people who move from deficient to sufficient levels of Vitamin D – guzzling pills to reach a “supraphysiological” level of Vitamin D won’t mean Hulk-like levels of testosterone. That said, there’s some disagreement over what a “sufficient” intake of Vitamin D really looks like. In the 1930s, when rickets were a significant public health problem, a program to fortify milk with Vitamin D was implemented in the United States to help combat it. Rickets are no longer a big problem, but today, estimates range from half to three quarters of Americans being “deficient” Vitamin D. The recommended daily allowance is 600 IU, which is about fifteen micrograms. Remember, if you have a relatively high amount of body fat, it’s worth erring on a higher intake of Vitamin D.
What’s the Best Way to Get It? Without spending some fifteen scantily-clad minutes in the sun every day, it’s hard to hit thousands of IU of vitamin D through natural methods alone. An egg contains about 40 IU, a cup of milk around 125 IU, and three ounces of pink salmon will bring in about 370 IU. That’s why Americans are buying more Vitamin D supplements than ever before. When shopping for them, you might find pills labelled Vitamin D2 or D3. (We don’t tend to use D1 anymore.) Some contend that D3 is “best,” and it’s true that one microgram of D3 is slightly more potent than one microgram of D2. However, that’s one of the reasons we measure in IU, or international units: this unit of measurement balances out the differences between the two forms, so 1,000 international units of D2 is about the same as 1,000 IU of D3. Some supplements, even staples like multivitamins and fish oil, still come with their fair share of controversy. Vitamin D isn’t really one of them. Most of us are low, and we need to be higher. If you’re not getting enough time in the sun, you’re almost certainly not getting enough vitamin D and you’re not functioning – or lifting – at your best. While some researchers may disagree as to how much is necessary and how wide-ranging the benefits are, the average diet and the average lifestyle does not even meet the levels required to avoid a deficiency, let alone optimal levels. Featured image via @jasonkhalipa on Instagram.